The best bluegrass teaching is tuned to a student's motivating desire to play music in a social context. Novices should be taught basic rhythm playing right away on slow easy songs first, following simple chord changes by watching a guitar. This is the beginning and the foundation of "playing real bluegrass" and comes with enough rewards to spark practicing and preparation. As new skills are learned, they are immediately applied to the jam, building enjoyment and motivation. It's fun and it's fundamental! Teachers can and should organize basic jams, guiding and coaching until the group can jam on its own. Students will practice and grow increasingly involved, I promise! The social context is central. Not just because bluegrass is a band, not a solo, form but because the social context is what drives everyone's interest and motivation. "My first new student after starting teaching full-time made me promise that I would teach him according to the ideas that you laid out in the recent Bluegrass Unlimited. That article has resonated powerfully with all of my students who have read it." I love bluegrass and what it's done for my life. I love the community, the grounding in honest, solid values, the spirit of both teamwork and independence... and ... it sounds good! I think more people should play bluegrass and tap into what it offers. And truly, I think the world would be a better place if more people played bluegrass. Adults, kids, everybody. This editorial speaks to how to make it easy and fun to learn to play. As you will see, my approach varies considerably from mainstream teaching. See what you think. I started slow, but once I learned to play, it was natural for me to get into bluegrass teaching. Since then (1964), I've made a study of how it's done most effectively, going from "haven't a clue" to "I have a lot of clues." 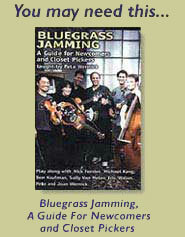 One clue is that most people who try playing a bluegrass instrument end up giving up within a year or two. That is similar to most music learning endeavors, excepting the zillions of 9 year-old piano students, who continue for years because they "have to", and then give it up. We all understand. Learning an instrument can be difficult, discouraging, and unrewarding. Bluegrass starts with a wonderful advantage. It's a pretty accessible music, where it can be surprisingly easy to get involved as a player. I like to say, "The first rung of the ladder is very close to the ground." Bluegrass has a clear rhythm, a lot of repetition, and we do wonders with three chords! Vince Gill's great song "The Key", tells how his dad taught him: "Three chords on the banjo is the key to life." Bluegrass songs are not always played in G, but they could be, with the G, C and D chords enough to play 80-90% of the repertoire of Bill Monroe, Flatt & Scruggs, the Stanley Brothers, and Jimmy Martin -- a giant portion of the great, core bluegrass material. So far, no apparent reason why anything should slow a person down. Smooth sailing. But ... then why do so many give up a year or two later? Clue: Learning solos to easy instrumentals is almost always the focus of novices' lessons and instruction materials. Yet even "easy" solos can be quite challenging to many novices, and take a lot of time to learn to do smoothly. Many months of lessons and practice might yield only a handful or two of semi-smooth solos, a total of a few minutes of music. Useful in the long run, but a pretty limited reward for all that effort. Another clue: What are people thinking when they take up an instrument? They'll learn to play it, and ... at some point, they'll be playing with other people. This is the fact that drives the demand for bluegrass teaching ... and yet is rarely addressed in the teaching. The student might be encouraged to go to a jam, but the most typical result is actually frustration, because he or she isn't properly prepared. Those relentlessly practiced solos don't figure in too much in an evening of playing; and even if the other jammers are encouraging, they might find it hard to slow down enough for a novice. They do lots of songs. The chord changes go so fast, and everyone seems to already know them. The student is intimidated more than most people can understand. "I'm not good enough," "This is too hard," "I'll never be able to do this," are typical feelings. A student's initial enthusiasm can be seriously weakened and even shut down. I consider this a true tragedy, and it happens far too much. I will address later the subject of jams that really do help and encourage novices. Yes, when people dream of playing a bluegrass instrument, it involves a vision of playing bluegrass music, a group activity. Without that, what's left? Closet playing, contests, playing solo for others. Not a bad solitary hobby. But for most, the reward is participation, such as parking lot jamming, a kid and a parent or uncle picking at home, a small music session after dinner with friends, any informal situation, on up to playing on stage. These situations are what a sociologist would call the social context. Clue: Music teaching for many years has routinely focused on exact note-for-note music compositions, played "verbatim", exactly from the written/read form of music on paper. (You know, what other musicians call "their music", as in: "Do you have your music with you?" "No, I left it home. Too bad we can't play." Wait a minute! Music is not print on paper. Music is sound.) Wow, this written-out thing has gotten out of hand. I know Beethoven needed to it achieve his musical dreams, but is that how Lester and Earl did it? Whom should we be following? Food for thought: Why did Earl Scruggs once tell me, "I have no idea how anyone can play a tune exactly the same way twice in a row." The title of this editorial is "A new direction in bluegrass music teaching". Am I going to propose doing away with written music and music teachers? No way. Those things are awfully helpful when they're good and used properly. Then what is the new direction? Teaching according to the student's desire to play music in a social context. Novices should be taught ensemble playing at an appropriate level (slow and easy). Since bluegrass jam groups don't have separate music directors, everyone has to learn how to share this function. Even as beginners, students should be taught these skills, practicing them regularly by playing with others. 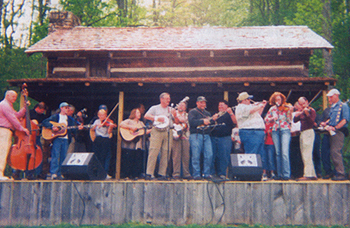 Once people learn to jam, then despite slowness and skill limitations, a group of relative novices can have fun learning to play bluegrass together. I say, based on 43 years of learning music and 40 years of teaching it, that this is the key. The social context is central. Not just because bluegrass is a band form, but because the social context drives everyone's interest and motivation. First, what material works best in a novice jam? The instrumentals that most novices start learning? Clue: Novices usually don't know the same tunes. Clue: It's hard for novices to play memorized solos without stumbles, rhythmic errors, and even the inclination to go back to correct errors. Several people taking turns soloing takes skill beyond just knowing the solo: They all need to start at the right time, and stay in time, regardless of stumbles. They have to provide backup, chords and rhythm. That takes time and experience to learn. For novices, I generally recommend against learning instrumentals, because they don't tend to work in novice jams. The alternative? If someone sings a good, simple song and strums the right chords, that's viable music. Simple but real and good music, and fun, too. In a group, it's the same: Play rhythm and change chords while someone sings the song. No need for instrumental solos. This is the easiest possible way to play bluegrass with others. Some songs change chords only two (Katy Daley, Tom Dooley) or four times (Little Birdie, Jimmie Brown the Newsboy) per verse. Why not start with those? While someone sings, follow the chord changes while keeping a simple rhythm. This is an example of what I call "lowering the bar". If a student keeps colliding with the bar, reduce the challenge and establish some momentum before moving on to the next challenge. Taking care to raise the bar only gradually will keep the momentum of successful effort. Students will practice more, eager to reach the next step. Successful easy jamming is a breakthrough for any student. A bridge has been crossed. As I tell students, after this, improvement is a question of learning more songs, more techniques, more speed, and better sound. Learning to solo comes in according to a student's desire and ability. As the skills are learned over time, they can be added gradually, in the context of ongoing simple jamming. Only when a person can jam a bit, do I encourage learning the first solos. Still no instrumentals. Song breaks are shorter, with simpler melodies, more interchangeable phrases, and are more likely to work in jams. Tablature can be a big help here. It's still hard, but now the student is better grounded. Success will come more quickly. The solos fit into a context that already works, and becomes more and more fun. At my camps I've seen quite a few players who can cruise though a tune, but then don't know what to do when someone else solos. Often, they don't know the chords. More holdovers from the days when solos were all that was taught. Most students, if asked if who near them would be up for a slow and easy jam, would say "Nobody." But surprisingly often, there are indeed other novice players nearby. However, as closet players, they aren't visible to each other. True story: Two women who work together both attended my recent jam camp in Morehead, KY. On the first day, they were amazed to see each other. "You play banjo??" "You play fiddle??" They'd known each other three years! A teacher can be tremendously useful to novices by inviting two or three or even ten beginner students to a little jamming workshop, and guiding them through easy ensemble playing on a few simple songs. What if this were a monthly or even weekly event? Could this include kids? Be all-kid? Why not? May I suggest some good repertoire? The List of Well-Known Two-Chord songs on my web site is up to over 70. There's another list of Common Jamming Favorites, plus check out the List of Favorite Songs that use Two or Three Chords . See DrBanjo.com's Instructional section for a wealth of learning material. Gathering students can be easy, by putting up notices at music stores and music events, and communicating with other teachers. Teachers and organizations might find such sessions a good source of revenue. Music stores would gain from hosting such sessions. Those motivated players will be buying capos, songbooks, straps, rosin, and someday a better instrument. Festivals and local concert promoters will see more of these folks this year, and in years to come. 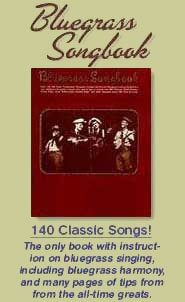 (More subscribers for Bluegrass Unlimited!) Some of these folks may one day become festival attractions. It's already happened with some of my jam campers! Once a group is working well, different types of soloing can be added. The easiest method is to "fake it" by just playing simple licks and rhythm techniques while following the chord changes. The next step up might be to play an exact tabbed basic solo, or (better) a self-composed one featuring melody. As more people try soloing in the group, others watch, learn, and build up the nerve to try it themselves. This phase is exciting to enter, and of course it creates motivation to really improve and master those solos. If problems arise in a student's solo playing, help is available from teachers, play-along instructional recordings (both audio and video), and even computer programs. Using them can straighten out timing errors and problems playing in real time, while building confidence through repetition. Want more licks, more tunes? Lots of tab out there, best used with recordings of what the tune or lick actually sounds like. When musicians are jamming together, using new skills, learning with and from each other, there's little chance they will give up playing music. I'd say they're hooked -- on bluegrass! More people spending less time in front of a TV, and more with each other. Wholesome fun. A bigger, thriving bluegrass community. A better world.